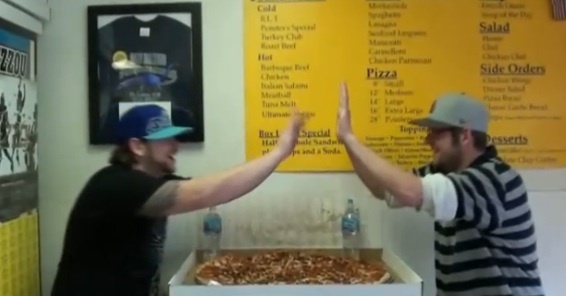 The contest costs $50 and is a 28″ Pointersaurus pizza which weighs ten pounds. Two people are allowed one hour to eat the pizza with either two meat toppings or four vegetable toppings. You must make a reservation at least one day in advance and the contest is only done at 3 PM each day. If contestants finish the pizza they are refunded their money and given a check for $500. Call 314-644-2000 to make a reservation. You get complimentary soda or water during the challenge. You must keep the pizza down for the entire hour. After the hour is up you may do whatever you or your stomach may wish to do with the pizza. As of January of 2009 there have been seventeen winners of the contest. 16 “teams” have won and recently another team tried…and failed. But at least they got it on video! It’s not a short video, so you’re going to want to skip ahead a bit, but don’t skip so far ahead you miss them sadly packing up their to go box. Good try boys! You gave it your all, but it just wasn’t good enough. We hear there’s a delightful scone eating contest coming to town if you ladies want to try something more your speed.